The Super Bungee Run Contest! 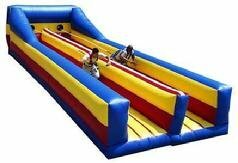 Description: The bungee run is an all time favorite! It is our safe, hilarious alternative to bungee jumping. Two players harness into bungee cords race down a 38-foot inflatable raceway trying to see who can place their Velcro baton the furthest. Just when they get to the end; boing, their bungee cords pull them back to their starting positions. This game is loads of fun and great for all ages.